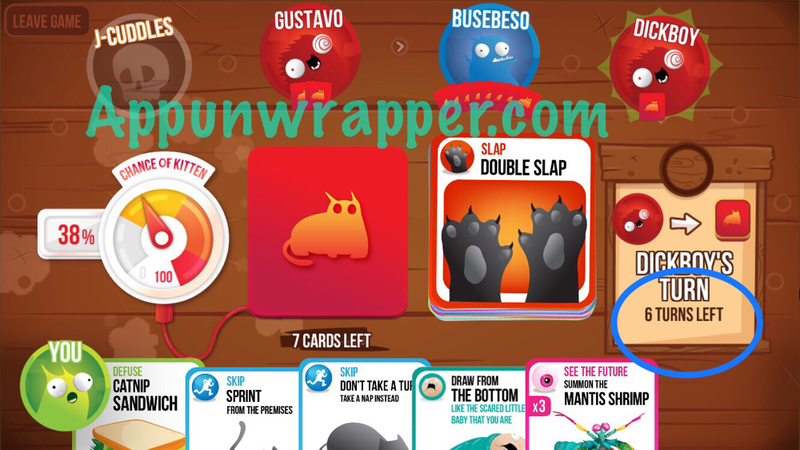 The highly successful Kickstarter-funded card game, Exploding Kittens, by The Oatmeal recently got an iPhone version. 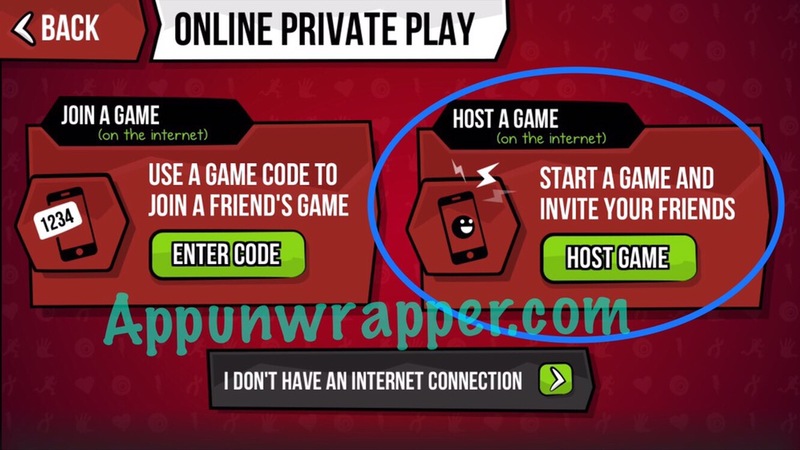 I didn’t download it until recently when it got online multiplayer capabilities. Since then, I’ve been playing quite a bit and I’ve picked up some decent strategies. I’m by no means an expert, but I thought I would offer some tips I think would be useful to those just starting out. There’s still a lot of luck involved, but hopefully this information will help you. If you have any of your own tips, feel free to share them in the comments section. 3. Now you have as much time as you need to change your name and avatar. When you’re done, just go back and join a public game. Your name and avatar will stay as what you chose. Note that some avatars can only be used if you buy the in-app purchase (IAP) for that pack. Early adopters got those for free, but now they cost $0.99 for each pack. First off, the goal of the game is to not draw an Exploding Kitten card. If you do draw one, you need to use a Defuse card before it explodes or you’re out of the game. Each turn you have the option to play a card, then draw a card when you want to end your turn. You don’t have to play a card, but you do have to draw one unless you play a card that allows you to skip doing so. The number of Exploding Kitten cards in the deck is equal to the number of players minus one. 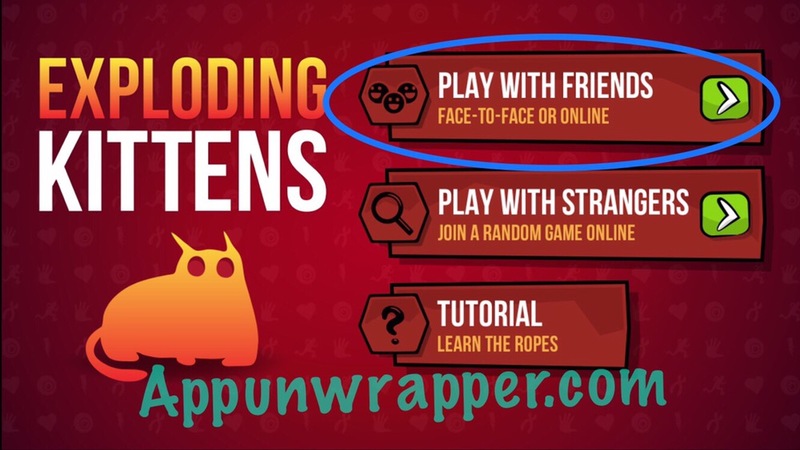 So if there are five players, there will be four Exploding Kittens. If there are two players, there will be only one Exploding Kitten. If a player dies, the Exploding Kitten card goes with them, making the remaining deck a little bit less dangerous. 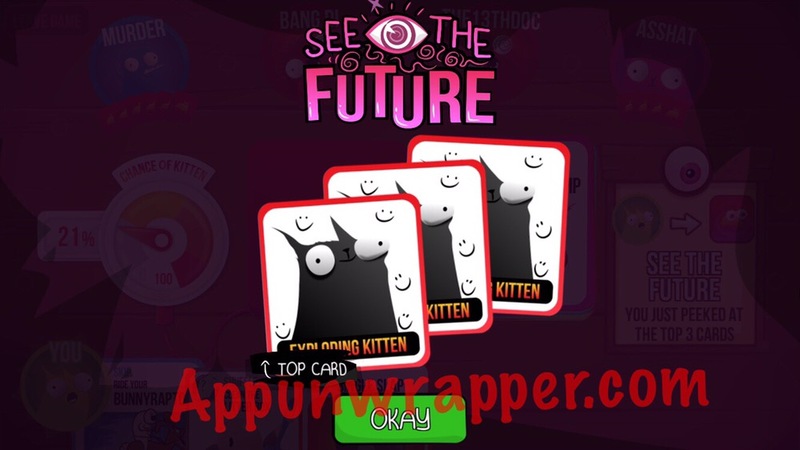 The meter to the left of the screen tells you how high a chance it is that the next card you pull will be an Exploding Kitten. There aren’t that many types of cards in the game. Most are just different skins for the same card. I’ll break each one down for you. 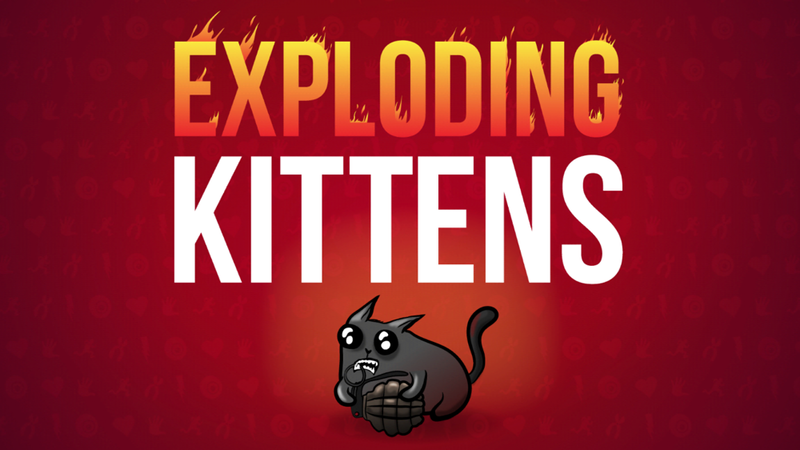 Exploding Kitten: Avoid this or Defuse it! Defuse: Everyone begins the game with one of these. This is your most valuable card. Do not waste it! Do not give it away! Try as best as you can to collect these and always have one on you. It’s your only way to continue playing if you pull an Exploding Kitten card. After you use it to defuse an Exploding Kitten, you’ll get to choose where to put the Exploding Kitten back in the deck! Fun! Skip: This is exactly what it says. It allows you to skip your turn and not pick a card. These are really useful when the chance of picking an Exploding Kitten is high. Try to keep some in your hand. Reverse: This allows you to skip your turn and reverses the order of players, so the person that went before you will instead go after you. 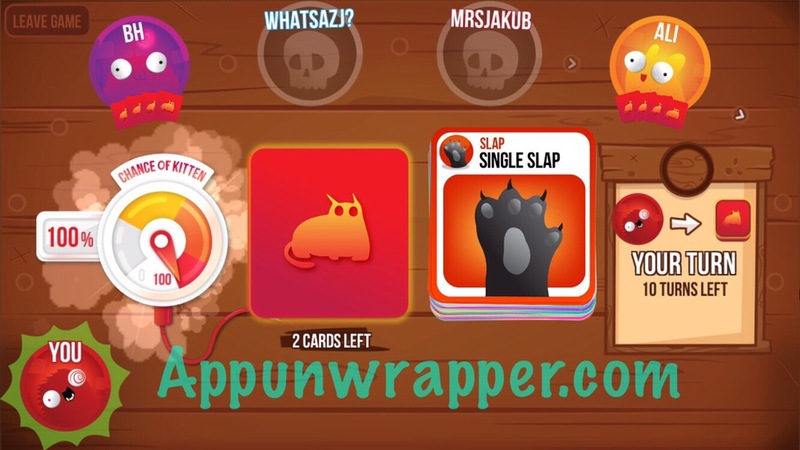 Slap: This allows you to skip your turn and instead choose another player to pick a card. These can build up and be passed off if players keep slapping each other instead of picking cards. One game I was in had two guys slapping each other until one had six turns built up! From what I can tell, the only way to avoid having to take all the turns is to pass them off to someone else with another Slap card. Skip and Reverse cards will still force you to take the rest of your Slap turns. Even if you use your turn and pick an Exploding Kitten, you’ll still have to use your remaining turns after you Defuse it. So if you get stuck with a bunch of Slap turns near the end of the game, you could be in for some trouble! Try not to waste these in the beginning, because you may just end up providing your opponents with more cards at the beginning of the game. Double Slap: Same as the Slap card, but the person has to pick two cards. Steal: As you might have guessed, this allows you to steal a card from another player of your choosing. They choose the card, though, not you. I suggest using these later on and with players who have fewer cards. You’re more likely to get something useful, perhaps even a Defuse card if they have nothing else left. If you want to be really mean, you can use a whole bunch of them to take all cards from one player. For instance, I thought I was being smart hoarding five Slap cards for the end since I had no Defuse left. Someone stole three of them from me in a row and I ended up with ten turns and no cards! Draw From the Bottom: This does as it says. If you have reason to believe that the top card is an Exploding Kitten, you can play this card to try and improve your odds. Shuffle: This allows you to shuffle the remaining cards in the deck. It’s useful if there are still a decent number of cards in the deck and you have good reason to believe that the next card is an Exploding Kitten, or you want to shake up the deck after someone else used a See The Future card. See the Future: This allows you to take a peek at the top three cards so you can decide whether it’s safe to pull one or if you should skip your turn, pull from the bottom of the deck, etc. Note: If this is your only card left, don’t waste it! There is absolutely nothing it can do for you in that situation other than tell you what you’re about to pick. So just hold onto it and pick the card, even if you know it’s an Exploding Kitten — it will have the same result. These cards are best used when you know the odds of picking an Exploding Kitten are high and you don’t want to risk picking one, since you only have one Defuse card. This would help you decide whether it’s safe to pick or if you should take some action to skip your turn. You can buy an alternate deck (or you got it free as an early adopter). This has a few unique cards that aren’t in the main deck. Blind: This turns all of your target’s cards into cat butts and then shuffles them. The only way to remove the status is to pick a card from the pile. This card is useful if you want to steal some cards from an opponent and want to have a better chance at getting something useful. It’s also useful in middle of a slap war. Try not to waste it! It’s an incredibly useful card. Annoy: This spills diarrhea (yes, you read that right) on a player’s card(s). That card is then locked and cannot be used until the player takes a turn and picks a card. The locked card also can’t be given away when someone uses Steal on you. A locked Defuse card can’t be used either, so this is a good way to force someone out of the game. This deck also adds a Triple Slap and 1x & 5x See The Future cards. I suggest taking more risks early on to try and collect more cards so when the chance of getting an Exploding Kitten rises, you’ll have more weapons at your disposal to fight it. I recommend you don’t use your Slap cards early on if you don’t know where the next Exploding Kitten card is. Sure, you might get lucky and the person you slapped will pick an Exploding Kitten. But the chances are higher than he won’t and he’ll just end up with more cards than you. Don’t just throw out all your cards in the beginning of the game. There’s no point. The person with the most cards when things get heated will be at an advantage. Pay close attention to what your opponents do. If one looks into the future and skips their turn, there’s a pretty good chance that the top card was an Exploding Kitten — unless they’re bluffing. 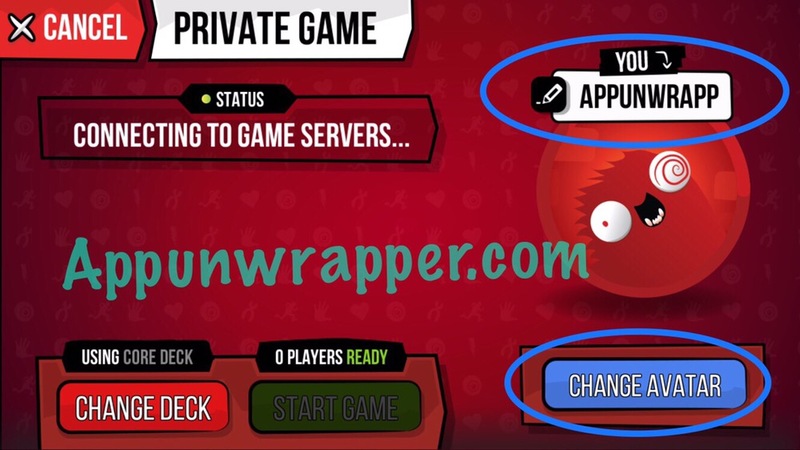 You can also try bluffing to trick other players! But then you’re also wasting a card instead of taking one. So that’s a big cost for a bluff. Also keep track of what you do. If you place the Exploding Kitten back into the deck as the second card, pay close attention to what happens after so you can do your best to avoid picking it again. And one last thing: Please don’t disconnect in middle of a game just because things aren’t going your way. Please put in your best effort until the end. Quitting early makes it less fun for those left playing. And that’s all for now! I think these tips should help you out. Let me know if you have any killer strategies of your own! You go into “Settings”, and press “Enter a code”.